How to copy music from iPod to computer? Now get a quick way to transfer songs from iPod to PC or Mac computer, no matter what iPod you’re using. Free download AnyTrans and follow this tutorial to quickly transfer music from iPod to PC/Mac computer. Compatible with iPod touch, Nano, Shuffle, Classic, Mini etc. It's hard to believe that everyday thousands of computer hard drives get crashed due to long-term use or accidental damage. And one headache is that only few of us have considered making a backup for our music collections, which may take several years to build up. The situation will get extremely terrible if a large amount of songs are downloaded from Internet or imported from CDs. You will feel lucky if you still have these songs on your iPods. But as you may know, you can only transfer music onto iPod but no way is avail in the opposite side. This guide will help you find the best answer about how to copy music from iPod to computer (PC and Mac). This tutorial covers all iPods ever made, including iPod nano, iPod shuffle, iPod touch, iPod classic, iPod mni, iPod photo, etc. AnyTrans is said as the best alternative to iTunes that helps manage music on iPod, iPhone and iPad. It helps transfer music from iPod to computer, to iTunes, and vice versa, plus no existing music will be erased. 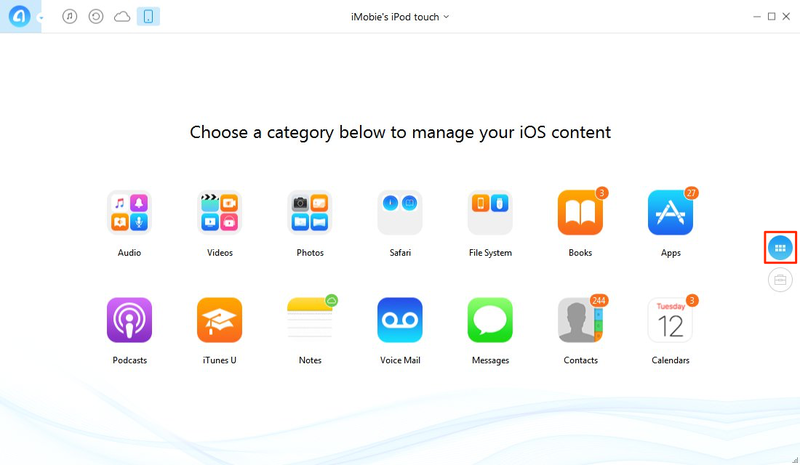 With it, you can also copy music from one iPod to another directly. If you are using a PC with Windows system, AnyTrans' intuitive interface will guide you through the whole transfer process in few clicks. Free download AnyTrans now and let it run on your computer. Step 1: Connect your iPod to the computer. If you have several iPods and want to put all songs there onto your PC, AnyTrans takes it easy to support unlimited iPods at once. Step 2. 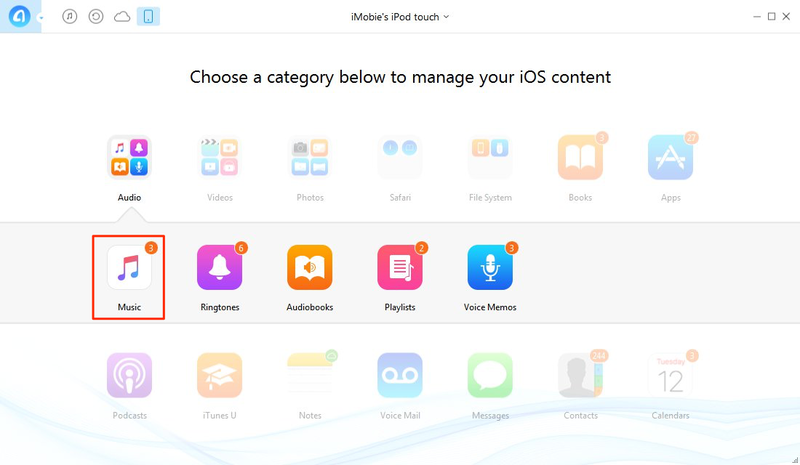 Click the button as below to manage your iPod content by categories. Step 3. Click on Audio and choose Music. Step 4. 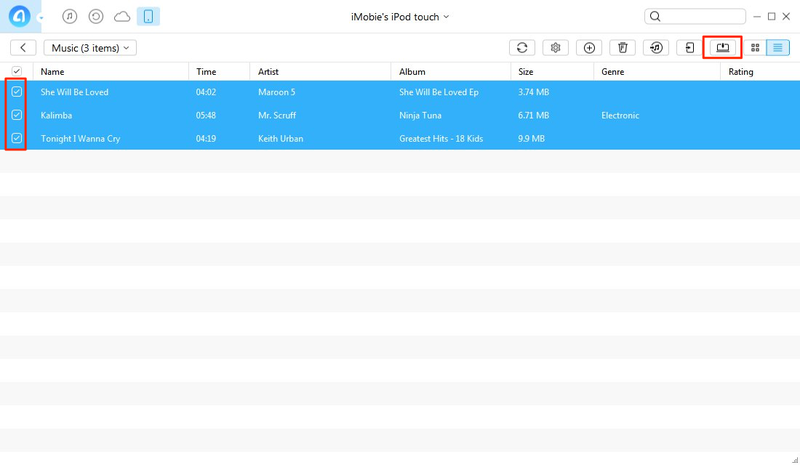 Choose the music you want to transfer, and click to PC/Mac button. Regularly AnyTrans will transfer over 7000 songs from iPod onto PC hard drive in only about 25 minutes, but the transferring speed also depends on USB cable, computer hard disk format, as well as other external factors. Step 1. Open AnyTrans, and connect your iPod to Mac. After AnyTrans recognizes your device, scroll down to the bottom and click on Audio > Music. Step 2. 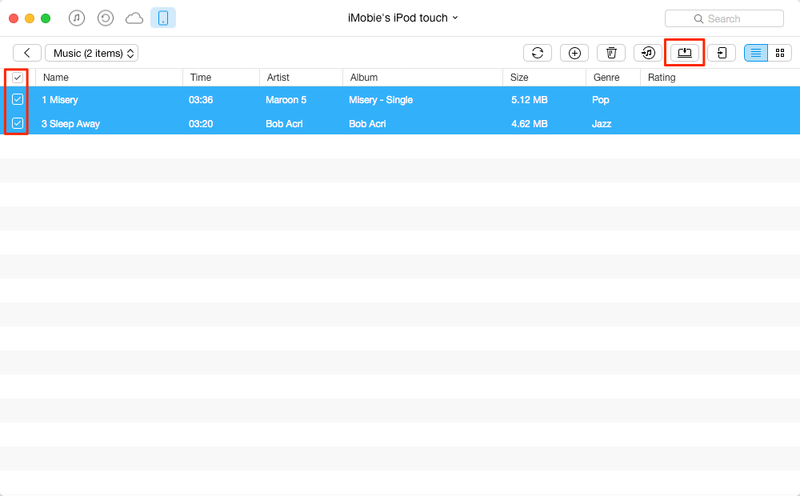 Choose the music you want to transfer, and click the to Mac button. AnyTrans is an excellent music transferring/copying software from iTunes to iPod and vice versa. Better than Itunes Sync where you have to erase first your existing Ipod music before the new music can be sync. Before finding AnyTrans, I had spent countless hours trying to upload music from my computer to iPod nano. This app is the BEST! and SO easy to use! A must have!